How does the brain decided what to remember and how can we use that to ensure that our core message is remembered by our audience? 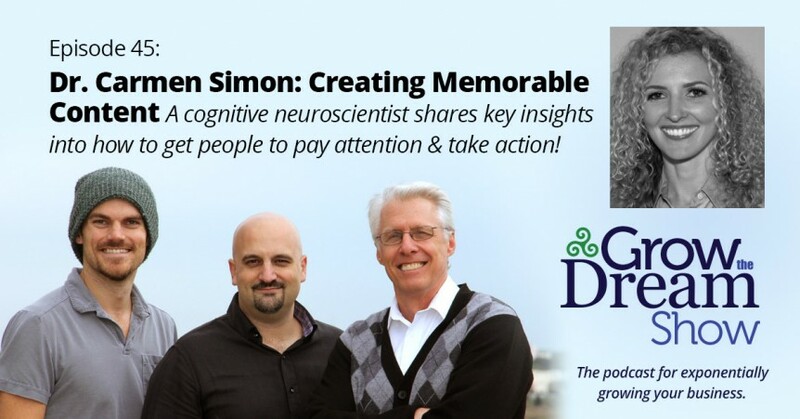 Dr. Carmen Simon, a cognitive neuroscientist, explains that your audience will forget something like 90 percent of what your content within two days. So the key is to control your 10 percent and make sure that using content, color, anecdotes, fact points and so on in the 90 percent is always pointing back to the 10 percent. No wasted rabbit trails! Dr. Carmen Simon is a cognitive neuroscientist and co-founder of RexiMedia, a training organization that helps presenters achieve better results. With two doctorate degrees—one in instructional technology and the other in cognitive psychology—Carmen brings a scientific approach to her work, which she used to develop the Rexi Method™. When she isn’t working with clients and training audiences, you may find Carmen keynoting for a conference or working on her forthcoming book for McGraw-Hill, due to be released in mid-2016.